In 2017 SEO strategy is more important than ever to rank your website at the top of Google. Keeping up with current search trends can be a full-time job but we’ve put together this simple guide to act as an essential 2017 SEO checklist. Every company needs that extra boost that high rankings on Google can provide, and many business owners spare no expense to achieve it. While it’s good to be proactive and enthusiastic, the truth is that such outbursts of activity will have a comparatively small impact due to absence of well-coordinated SEO strategy. To align all your efforts into a single structure that props up the sales numbers over a longer period, you first need to formulate your plan on a more abstract level, with the most attention paid to building long term relationships with your customers. SEO practices are simply technical tools to realise the plan, not some kind of a ‘holy grail of marketing’ that should be revered without any real understanding. No, you don’t have to be a marketing guru to be able to process all this. Anyone can follow this simple 5-step procedure and come up with a logical, comprehensive 2017 SEO strategy that will result in high ranking on search engines in if it is executed properly. The same process applies for business owners and marketing professionals charged with improving the SEO landscape for a client, although it is highly preferable to have the main stakeholders directly involved. Some of the decisions might require serious adjustments to company policies and/or product range and can’t be made in a vacuum, which necessitates firm dedication and a great deal of flexibility on the part of the company. Like all good strategic outlooks, our guideline starts with some really basic questions. Instead of getting lost in a labyrinth of technical SEO terminology, it might be a good idea to kick off the campaign by tackling the central issue – what are your potential customers searching for on the net? If you are able to make a connection between a frequently searched group of terms and a key facet of your business, you can gain the inside lane in the race for customers and exploit it to build strong market positions. Remember, your mission is to give the people what they want, so you need to understand how their interests and needs translate into online searches and consequently into purchases. Solving this puzzle will allow you to see clearly which of your products have the greatest marketing potential and how you should formulate your offer to fit the existing window of opportunity. You can also try to design new products or services specifically for this purpose, or to change some of the basic organisational tenets you’ve been accustomed to in the past to better suit the times. Please note that this initial step requires more than just gauging current demand in the market, it is a much deeper process that includes analysis of information patterns and conceptual redefinition of company goals. As such, it should never be taken lightly or skipped altogether. To acquire customers and make them happy, you need to deliver value. Perception of value might be more than a little subjective and varies wildly from industry to industry, yet it is one of the strongest factors impacting the revenue streams. If you want your SEO campaign to bring home some tangible results, it needs to communicate the added value the users can receive by visiting the website. Once you’ve identified what is your value proposition, getting it across becomes merely a technical issue that can be handled by an average marketing agency. In other words, this step demands that you step back and think hard and long about your business model, figuring out why people would choose you over the competition. Ideally, the value you provide would be totally unique in the market and the purchasing decision would thus be very simple, and you should strive for this situation even if things rarely work that smoothly in the actual marketplace. Keep in mind that value doesn’t have to be financial or material – a more personalised service or favourable customer relationship policies could do the trick quite well. What matters is to outclass the competition in one way or another, either by originality of your ideas or by sheer quality of your merchandise. Logical progression from analysis to action implies that you need to send out a clear message about the benefits your business can provide to customers. In the online medium, it is very simple to put out an announcement whenever you want, but it can be very difficult to ensure it receives proper attention due to the overwhelming number of competing messages out there. That’s why broadcasting your offer on your own social media accounts is not nearly enough, and you must find a broad range of partners to add weight to your punch. Ideally, those would be high-authority sources that are regarded as influential by your prospective customers as well as the search engine algorithms. Identifying the best amplifiers for your campaign is just one half of the job – you also need to motivate them to assist you. In many cases, paying them directly would be either impossible or highly impractical and you need to get a little creative here to get what you need. In some cases, you could try to leverage your existing customers to get the word out more quickly and expand your outreach. Some of the more persuasive voices in the virtual world (bloggers, media outlets…) could also have a vested interest to cover your business and all you need to do is initiate contact. Compensations or counter-favours might work too, so you might have a few options on your disposal even without a budget. Online visitors are nice, but paying customers are better. If you are unable to convert the former into the latter, the promotional side of your 2017 SEO strategy is set up for failure. Of course, this issue greatly depends on your primary business model and must be solved individually for every company. The solution should naturally arise from some of the previous steps listed in this guideline, since understanding what people are looking for and what makes your offer special will definitely help you come up with a reasonable way to close the sale. At this stage, you have to see your own traffic flow clearly and be able to direct it towards the most suitable areas on your website. A large part of conversion optimisation is dependent on presenting the business value provided by your company in a way that search engines can easily recognise and ultimately how well it ranks your content. It’s not enough just to include all the right keywords, as users need more than a generic match to be persuaded to buy what you are selling. Each visitor needs to be guided through a series of logical steps that ends in a purchase, while accounting for the fact that some purchases take considerably longer to complete. Don’t just assume that your leads will automatically amount to better income, try to project your visitor’s needs and arrange your website in such a way to alleviate their concerns and stimulate urgent action. If the user doesn’t click on that ‘buy’ button, the money spent to bring him to your site will be wasted. Finally in your 2017 SEO strategy, you need to think about high-quality content that will be the material manifestation of the campaign, opening the transition towards the tactical level. As you already know, content can be produced in a wide variety of formats, from simple text to high-level multimedia, depending on your exact business needs, production capacities and available budgets. Once completed, the content will be used to populate your website and present your offers on social media and external platforms, so it needs to be carefully designed and include all the most relevant bits and pieces of your business philosophy while staying visually attractive and easy to consume. Of course, the content must be keyword-rich if you want it to be ranked high on related searches, but this is not the only concern you have. It also needs to be well-organised so that key features of your business you want to emphasise are already visible from the title and basic description. The internet is a very busy place and you can’t expect users to dedicate a ton of time to decipher the message, especially since the competition is actively trying to steal them away. Content production must become a natural extension of your main activities, a process of publicising the benefits your business delivers in a user-friendly format. This is certainly not an item to save money on, since it will be a primary tool for gaining new customers, although you’d be surprised how much can be achieved with pretty basic stuff such as well-written blogs and clean-looking product shots. Planning out an entire SEO strategy is no easy task, and this is where we come in. Our team of experts at The Content Works are well versed in reliable SEO methods that deliver results naturally and lead to long-term success and traffic. 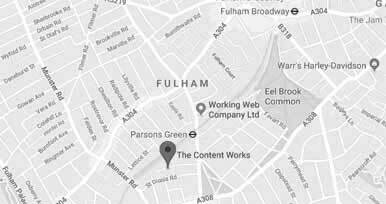 To have a chat about how we can help you nail your SEO strategy, drop us a line on 0207 305 55 99 or email hello@thecontentworks.net.